I've wanted to talk about this topic for a while but I've never been able to articulate it just how I wanted to so I put it off until my wonderful friend Charli posted a brilliant post on the topic and suggested I share my views. Flaws are defined as "1. a mark, blemish or other imperfection which mars a substance or object. 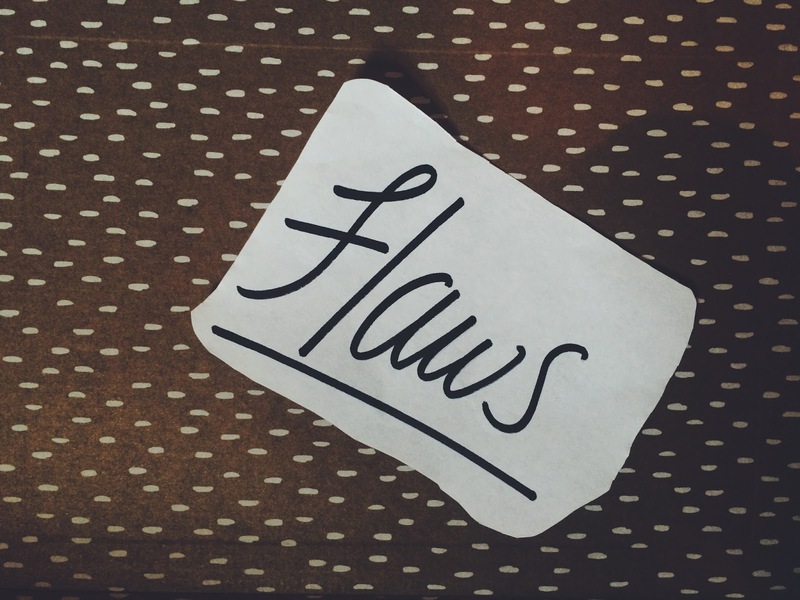 2. mar, weaken or invalidation of something"
Now when I think of flaws I instantly go straight to my face and body to point these out. I don't particularly like my nose and the way it has a bit of wonkiness to it, I don't like how big and liney my forehead is, I have to spend extra time smoothing out my foundation to avoid a forehead looking like collection of streams running to nowhere, and lastly I don't honestly like my smile. If we take the second definition, I feel as all flaws are not always physical. For me I feel as if my pessimism and feeling unsure as to whether people like me as a flaw. I'm aware I'm horrendously uncool and often second guess how people feel towards me for example, I recently went out on Friday and saw some people I've met countless times and I still had those feelings tugging at me...whether they like me or I've made a bad impression and so on. With that all written down, it's a bit sad. Sad that I find that many things wrong with me and that other people will have the same type of lists. Learning to be happy within yourself and ultimately loving yourself is a difficult thing to learn to do but it's so worth it. I find myself sometimes thinking "I look GOOD today and I'm happy about it, I'm going to go parade my massive moon head to the world" and it feels great to have that confidence even if it's not exactly permanent. Could you imagine how boring the world would be if everyone was the same, if everyone looked like a model and behaved the same way? Your flaws are yours. They make you, you and there's nothing wrong with that. Embrace them! Just like I said in my Being Unapologetically You post "Embrace your quirks because 9/10 people actually like your uniqueness shall we say? Post your selfies despite how many likes they get because YOU like them, it's YOUR account and even post your multiple chin derps because let's all be honest here, THEY ARE FUNNY." And sometimes, Beyoncé it out. Make sure to head over to Charli's blog and Youtube and show her some love! "I'm going to go parade my massive moon head to the world" YES THIS! Loved this post Trudy :) I'm updating my post with a link to this one. I think it's so funny how our flaws can be our greatest strengths, yet we see them as negative things. Great post! Great post! Put a smile on my face! I LOVE that! I've never thought of my imperfections as something that I own. And if you really start to think of your flaws in that way, there's nothing stopping you from fully taking charge of how you (and others) perceive you. Owning who you are, flaws and all, is beautiful! And I'm thankful to you for reminding me of that.